As you know my book, A HUMAN ELEMENT, is being published in March 2012 by Echelon Press. I wish my mom were still alive to be a part of that. But here’s the thing. If she were alive I would not have finished writing a book. I would not be getting published. I wouldn’t be here right now doing this if it weren’t for my mom. She died from cancer 2 years ago. This strong and vibrant woman. I watched her become a shadow. And then I watched her go. I took care of her in the final moments. Then she slipped away. And I knew I had to make my dream come true. Write my first book. And then another. I had wanted to do it for years. 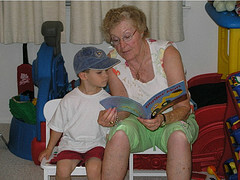 My mom loved to read to grandson, Joshua. Wish she could read my books now. My mom’s life was gone. Mine half over. But mine was still here to conquer. She was always my #1 champion. I had to now my be champion. She was my mom. My safety net. My battle of wills. She defined who I am and who I hope to be. She was the world’s greatest character, the shining light to so many. And she’ll now be the model for a character in my newest novel. So, I guess you could say I wrote from grief. It healed me. It comforted me. It made me feel like I was doing something for my mom. The author, Michael Kimball, wrote his novel US from this sort place. How true his words are in this article and here. “There is a lot of love in grief”. That is true and comforting, premier-pharmacy.com/product/lipitor/ isn’t it? Another author who wrote from grief is Ann Hood. She lost her will to read and write after her 5 year old daughter died suddenly from virulent strep. She eventually took up knitting to comfort her. From her healing grew the tale The Knitting Circle about a woman who loses her 5 year old daughter to meningitis and how knitting comforted her during a time of terrible anguish. Maybe someday I’ll write about those last few days and moments with my mom. But it’s still too close for me just yet. So I wrote for my mom first. It was my way of talking to her then. To heal. To accomplish something I told her I always would. Now I have and I can write for me. My first book maybe the one that sits in a drawer. Don’t we all have one sitting in a drawer? Someday I’ll come back to it. Maybe. But that book led to another. And now another. And now a 4th one I am starting. All in 2 years. What a long way I have come. So, thanks Mom. For bringing me to what I always wanted to do in my life. Write books. I know I am not the only story like this. What drove you to sit down and write that first book? Was it a special person or an event? What keeps driving you? I found some answers here by other authors on what inspires them to write. Is one of these yours? How did you finally write your first The End? Tell me here. First, I am sorry you lost your mom. As for the inspiration for writing, I have been writing THE END since grade school, inspired by nothing more than my own interest. 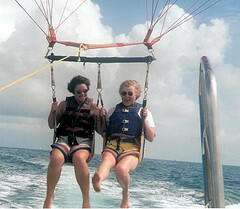 In high school, I met my best friend, Donna Hanson, who was also a passionate writer. We fed each other’s inspiration, reveling in the synergy. After she died at age 32, my writing process was shattered and I had to figure out a new one (if you’re interested in details, I blogged about it here http://wp.me/pZ1r9-o). My master’s thesis was also about her (she died in my last year of that program). It was a short story based on the last 2 weeks of her life. I needed to write it. Now I write for myself, but also a little bit for her, because I know she would have been as overjoyed if I got published as if she had. It hasn’t happened yet for me, but I keep trying! I love the way you describe the shifting mantle of responsibility: “I now had to be my own champion.” You were lucky to have her as a role model for that championing thing–it can be hard to figure out, and is the transition that so many fail to make. AND I LOVE THIS PHOTO! How amazing. Of course I find inspiration in all of life’s setbacks and challenges–thus my blog, http://HealingThroughWriting.blogspot.com. Without the conflict, there is no story, right? Kathryn, thanks for your kind words. Your Healing Through Writing blog is inspirational for us all! And yes, conflict is what drives the painful changes, that can make us stronger and more independent on ourselves for our own happiness.